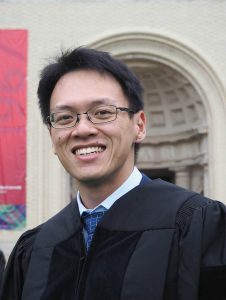 Dr. Adrian Chong is an Assistant Professor in the Department of Building at the National University of Singapore (NUS), where he conducts research on building performance simulation, building data analytics and uncertainty analysis. He received the Overseas Graduate Scholarship (OGS) to do his Ph.D. in Building Performance and Diagnostics at Carnegie Mellon University (CMU), where he was also a researcher at the Center for Building Performance and Diagnostics (CBPD). He holds a BSc (Projects and Facilities Management) and MSc (Building Science) from the National University of Singapore. PhD (Building Performance and Diagnostics) (2017), Carnegie Mellon University, USA. MSc (Building Science) (2012), National University of Singapore, Singapore. BSc (Project & Facilities Management) (Hons, 1st Class) (2010), National University of Singapore, Singapore. Assistant Professor, National University of Singapore (2017 – present). Research Assistant, Carnegie Mellon University (2012 – 2017). Teaching Assistant, National University of Singapore (2010 – 2017). Research Intern, Toshiba Research and Development Center, Japan (Dec 2015 – Jan 2016). Deputy Programme Director, BSc (Projects and Facilities Management), NUS (Jan 2018 – present). Fellow for Global Future Council (GFC) on Cities and Urbanization, World Economic Forum (WEF), (November 2017 – September 2018). Session keynote, Asia Conference of International Building Performance Simulation, ASIM 2018. Presentation title: Integrating digital building simulation models with data and machine learning. Member of Scientific Review Committee, Asia Conference of International Building Performance Simulation, ASIM 2018. Member of Scientific Review Committee, Building Simulation and Optimization 2018 Conference. Coordinator, Practical Training Scheme, NUS (Jun 2017 – Dec 2017). Coordinator, Work Experience Internship, NUS (Jun 2017 – Dec 2017). Building performance modeling and simulation. Application of machine learning and statistical modeling to building data. Integrated web-based platform for lifecycle building energy modeling, Ng Teng Fong Charitable Foundation (NTFCF) Research Funding, Principal Investigator, $474,043.20 (1 July 2018 – 31 December 2020). Generating certified energy models in Singapore through an M&V framework: A pilot study, NUS Start-up Grant, Principal Investigator, $179,519.60 (1 July 2018 – 31 December 2020). Lifecycle BIM Integration with Energy MM&V for Net Zero Energy Building. Singapore National Research Foundation, Green Building Innovation Cluster (GBIC) R&D, Principal Investigator, $963,000.00, (01 July 2016 – 31 December 2018). NUS Overseas Graduate Scholarship, National University of Singapore, 2012 – 2017. IBPSA-USA Scholarship for BS2015 in Hyderabad, 2015. Best innovative workflow for ASHRAE LowDown Showdown modeling challenge, 2015. Best Proposal (Better Buildings Case Competition), U.S. Department of Energy, 2013. Most Innovative Proposal (Better Buildings Case Competition), U.S. Department of Energy, 2013. Lee Kuan Yew Gold Medal, National University of Singapore, 2010. SISV Gold Medal, National University of Singapore, 2010. NUS President Sports Award – Team, National University of Singapore, 2007. Copyright © 2019 Adrian Chong. Powered by WordPress. Theme: Accelerate by ThemeGrill.